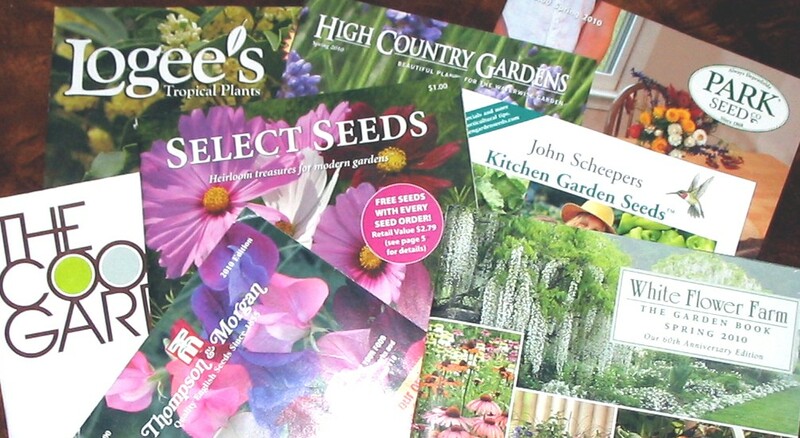 One bright spot for January doldrums is exploring catalogs for spring plant and seed selections. My favorites are Bluestone Perennials, High country Gardens, Park Seeds, Thompson & Morgan, and White Flower Farm. There are many more good seed companies sending out catalogs, but I’ve had great luck with my purchases from these companies. Bluestone Perennials in Madison, Ohio, offers a wide selection not only of perennials but species and cultivars of their perennial selections along with herbs, grasses and shrubs. Whenever I’m looking for a particular plant, Bluestone Perennials usually has it for a very reasonable price. I love High Country Garden, which is a nursery in New Mexico specializing in plants for the West. While I generally try to purchase plants from nurseries closer to my growing zone and climate, High Country specializes in drought tolerant plants and groundcovers, many of which are well known perennials hardy in my area. (I avoid those plants with the cowboy hat designation — they usually prefer an alkaline soil.) Since their specialties are my gardening goals, and my sandy soil if fast enough draining for even desert plants, I buy from High Country. Park Seeds is another great nursery. The have myriad plants and seeds for both the flower garden and vegetable garden. The also have wonderful new introductions. I also get their newsletter. Just look at these SunPatiens®. They promise “that even if you live in a hot climate, SunPatiens® will grow in full sun! The perfect solution for gardens that wind through both sunny and shady spots, it blooms from spring through summer and into fall, with big 2- to 3-inch flowers on bushy, well-branched plants. There’s no other Impatiens like it in the world!” Parks also carries Stevia, an herb that replaces sugar. I’ve decided to try it this year. I’ve purchases plants from White Flower Farm in Connecticut for… hmmm… at least twenty years. I do have to be careful about hardiness, as the plants I select are inevitably for zone 5 or 6. WFF has always stood behind its plants. The one time I had a shrub die, they replaced it. I appreciated that, and the replacement grew just the way I imagined it would. Their catalog is in a class of its own, the pictures way too enticing and the commentary often quirky and entertaining. Most of these nurseries have web pages. How great is that! I can look and explore all year-round. They usually have web specials and often opportunities to receive a newsletter via email, just to keep you up to date.